Ever since cacao (pronounced by the English as "cocoa") was combined with sugar, and sometimes milk, CHOCOLATE has been a favorite vice of people all over the world! 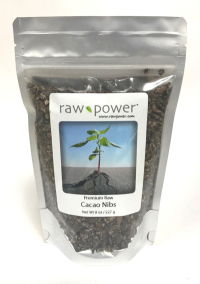 Now, with the import of raw, organic cacao nibs, you can satisfy your taste for chocolate healthfully. These nibs are dairy-free, sugarless dark chocolate. This heirloom variety of cacao is pure and low-temperature dried in a proprietary process that protects their unique flavor and nutrient levels. Many people enjoy adding the nibs to smoothies for a "dessert" smoothie, or blending with natural sweeteners to make healthful "chocolate" treats. Note from Rawpower: Because there is much debate and acrimony in the health food world over cacao, we thought it best to be clear about our position on it. We think cacao should be viewed and treated as a flavor, like cinnamon and vanilla, rather than an "eat-alone" or staple food. Yes, cacao is reported to be high in anti-oxidants, but so are blueberries, plums, apples, nuts, etc. And cacao is a stimulant. If you are using raw, organic cacao in place of candy bars and other chocolate treats, that is a positive switch, but don't fool yourself into thinking a raw, organic cacao treat is more of a "super" food than an organic green salad or seasonal organic fruit plate. Use cacao judiciously and enjoy all of the great super foods your garden, farmer's market and/or organic produce section have to offer!